For the past seven months, an investigation has been underway into the origin, cause and consequences of a fire that started on November 23, 20165, in an area of the Great Smoky Mountains National Park referred to the Chimney Tops. The investigation is now complete the investigation was led by the Tennessee Bureau of Investigation with the assistance of the National Park Service and local law enforcement, as well as various other local, state and federal agencies. The investigation involved thousands of investigative hours, over 100 witness and expert interviews across multiple states, thousands of potential witnesses, as well as thousands of pages of documents, records photographs and hours of video evidence and audio recordings. The District Attorney’s Office for the Fourth Judicial District would like to thank all agencies, law enforcement and otherwise, including the TBI, the National Park Service, the Sevier county Sheriff’s Office (with special recognition for the outstanding work done by the GIS Division), the Gatlinburg Police Department, the Pigeon Forge Police Department, the Pittman Center Police Department, the Department of the Interior, the Bureau of Alcohol, Tobacco and Firearms and the Tennessee Department of Agriculture, Division of Forestry, for their incredible hard work in investigating this unprecedented event. This office would also like to thank and commend the hundreds of firefighters and police officers from the national, regional, state and local levels for their extraordinary bravery and courage in confronting these fires. USDA and partners committed $20 million in 21st Century Conservation Service Corps partnership agreements to provide 4,000 work opportunities for youth, young adults and veterans up to 35 years old, a move that will help the U.S. Forest Service accomplish mission-critical infrastructure and landscape restoration projects on the ground. The U.S. Forest Service is one of seventeen USDA Agencies. Involving veterans in these opportunities helps them learn new skills while continuing to serve their nation and local communities. In FY 2016, 910 veterans were engaged on Forest Service volunteerism and service projects, of which 170 participated in 21st Century Conservation Corps projects. In FY 2017, the agency expects to hire 186 veterans. Projects will be on public lands in rural communities from coast to coast and will include diverse work experiences. For additional information about funded projects, jobs, volunteering and other opportunities for young people, visit the Forest Service online Working with Us page. On August 21, 2017 at approximately 2:30 pm EDT a total eclipse of the sun will pass over parts of southeast Tennessee. What some are calling the "Great American Eclipse" will pass over 12 states, including Tennessee. The eclipse (partial) will be visible throughout the United Sates. A 70 mile wide path of total darkness begins in Oregon and exits the nation at South Carolina. Areas within the 70 mile wide path will experience total darkness for up to 2 mins 40 seconds. The southern portion of the Cherokee National Forest (Ocoee & Tellico Ranger Districts) is within the 70 mile wide total darkness path. During a total solar eclipse shadow bands are often seen on the ground as totality approaches; Light filtering through leaves on trees casts crescent shadows as totality approaches; Wildlife often prepare for sleep or become confused; and temperatures can drop several degrees during totality. Cherokee National Forest: Some people may wish to view the eclipse in a more natural setting. Much of the Cherokee National Forest is remote and rugged, and the environment is much different than in urban areas. Planning your visit ahead of time may help make it more enjoyable and safer. Some locations that may seem suitable for viewing the eclipse in the southern Cherokee National Forest may have environmental or road access concerns associated with them. Many locations outside of developed recreation areas have rough dirt/gravel roads leading to them with limited access, parking, crowd capacity, restricted traffic flow and no sanitation facilities or water. Shenandoah National Park will waive entrance fees for all park visitors on Saturday, June 17 in celebration of Park Neighbor Day, an annual event held on the third Saturday of June to honor our neighbors who live in the counties and gateway communities surrounding the Park. Visitors are encouraged to stop by the Big Meadows Wayside (mile 51 on Skyline Drive) from 11:00 a.m. – 4:00 p.m. to learn about the rich heritage and diverse amenities available in our gateway communities. The Park's partner organizations (Shenandoah National Park Trust, Shenandoah National Park Association, the Potomac Appalachian Trail Club and Delaware North Corporation) will also be present to highlight the important activities they undertake to support Shenandoah National Park. There will be music by local artists and exhibits by our local communities to showcase the variety of features they have to offer. Superintendent Jennifer Flynn said, "Shenandoah National Park is a part of the fabric of our communities, providing nearly $96 million in economic benefit, as well as health benefits and recreational opportunities. The Park's surrounding communities enrich our lives and our visitors' experiences with their vibrant downtowns, agritourism, and historical resources, including Civil War battlefields and so much more. We hope many of our neighbors will take advantage of the fee free day to rediscover the park and enjoy the activities offered during Park Neighbor Day." Other special events will also be taking place at Byrd Visitor Center (mile 51 Skyline Drive) on Saturday, June 17. 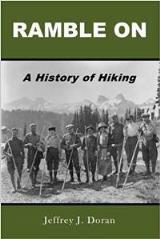 Renowned author Jeff Alt, of the book Get Your Kids Hiking: How to Start Them Young and Keep It Fun will present a program at the Byrd Visitor Center auditorium from 11:00 a.m - noon. Join Jeff as he teams up with Shenandoah National Park Rangers to lead kids and accompanying adults on a short hike loaded with hands-on family hiking tips and ways to explore the outdoors. This short family stroll turns a walk in the park into a fun-filled, multi-dimensional adventure that kids of all ages and parents will enjoy. Jeff will return to the Byrd Visitor Center on Sunday, June 18 from 1:30 p.m. – 2:30 p.m. to present a program featuring interactive time travel adventures based on his book The Adventures of Bubba Jones: Time Traveling through Shenandoah National Park. Jeff’s Bubba Jones stories are designed to engage kids with wild animal encounters, interesting history, science, and the environment and will have your entire family excited to take your own Shenandoah adventure. These programs are free to park visitors. A special presentation on June 17 by Artist-in-Residence Kevin H. Adams will take place at 1:30 p.m. in the Byrd Visitor Center auditorium. Come and experience his interactive demonstration showcasing his artwork that is inspired by the wonder of the national parks. This program is also free. Shenandoah National Park's official concessionaire, Delaware North will welcome park neighbors by providing residents of the surrounding counties with discounts. They will provide a 10% discount on select items in their retail stores and a 10% discount on food and some beverage items at all their restaurants. Visitors wishing to take advantage of these discounts will be required to provide proof of residency by showing their Virginia driver's license. For more information about our special events, please visit our website at https://www.nps.gov/shen/planyourvisit/special_events.htm. Spring 2017 brought good news for anyone worried about Great Smoky Mountains National Park. The park experienced headline-grabbing wildfires in December 2016, leaving many who love the park worried about its condition. We’re happy to report that both GSMNP and the city of Gatlinburg have recovered nicely. The forest floor is recovering rapidly with new green shoots in the scattered burn areas, and Gatlinburg is in full swing as a bustling attraction filled with fun, music, people and excitement. As spring came to the Smokies in 2017, we saw the whole area become green. Soon we learned that, of the 800 miles of hiking trails in the national park, only 4 trails would remain closed for upgrade work, while all the rest were already reopening. Park rangers worked hard through the winter to restore the greatest accessibility for the greatest number. And visits to the park, by the end of April, had actually edged up slightly over last year, which was itself a record-breaking year. Throughout the winter it was clear also that food supplies for wildlife were unaffected, and habitat damage was minimal. The animals experienced the same terrifying kind of trauma and sometimes individual loss as the humans in the area, but for the most part they survived. And in spring we've seen great activity in the national park. 2017 is a good year to catch sight of new bear cubs with Mama Bear, deer and their fawns, coyotes and even the elusive, fast-moving bobcats. It's a strange thing to say, after the loss and heartbreak of the winter fires, but springtime in the Smoky Mountains this year reminded us that Nature can put a forest fire to very good use for regeneration and renewal. The fires probably killed a lot of parasites and already-weakened plant systems, including the dead hemlock trees that were such a sorrowful sight. What's happening now is the intense regrowth that follows a fire. During March and April we saw an amazing bloom of wildflowers, and the forest floor - the understory - came alive with regeneration. 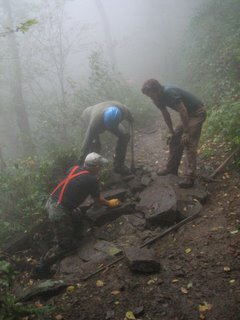 The tireless volunteers of Great Smoky Mountains Association (GSMA) recorded video clips and photographs of some of these quiet events happening low to the ground. This YouTube video clip from March shows the regrowth beginning with Table Mountain Pines, a fire-adapted species whose seeds are helped to propagate through fire: Table Mountain Pine Stand. And here in a Facebook video clip are the parasite-devastated hemlock trees that looked so bare and were such an anxiety for lovers of the forests. They were taken by fire, almost perhaps as nature's way to reduce their presence? It's an interesting thought: The Fire and the Hemlock. Down at the soil level, fungus proliferates. Fungus seems to heal all soils, and in the burn areas fungal colonization is coming on strong. Here are some pictures of mycorrhizae, perhaps the most beneficial fungi throughout the world, the hidden helpers that coexist with plants and trees - often the first to appear after wildfires, beginning the process of renewal: These Are the Mycorrhizae. 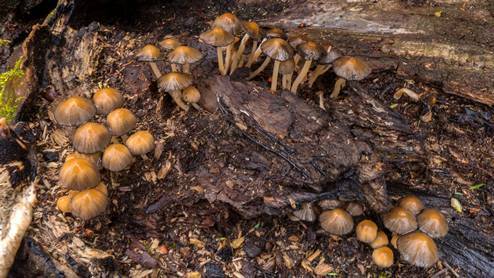 And in this latest “Smoky Mountain Minute” video from GSMA, University of Tennessee professor Karen Hughes describes a variety of fungi that are abundant this spring: Wildfire Mushrooms. It was always hard to get the word out that Gatlinburg and the surrounding areas were only sporadically hit by the fires. We're accustomed to watching wildfires on TV that cover thousands of acres in one huge swath of fire, marching on against firefighting efforts, and leaving a vast, monolithic area of devastation in its wake. But this fire was very different. The fire started on the ironically and aptly named Chimney Tops, a high outcrop hard for firefighters to get to. Then the winds came, with storm-force velocities that picked up embers and threw them across many miles, so that new hot spots sprang up with no warning, often surrounding firefighters who were then hard-pressed to flee for their lives. And 14 people didn't make it out alive of the dizzying cauldron of fires. The speed and surprise of the countless new small fires are what made this fire event so terrifying. But also, by contrast, this sporadic and random effect left immense areas - and all the major attractions of the area - completely untouched by fire. If the extreme winds carried the sparks very far, they also seemed to carry bad news across the country instantly, long before the more sober reality could catch up. In the first hours we heard that Ober Gatlinburg, the ski area on Mt. Harrison above Gatlinburg, was completely destroyed. But when the smoke cleared, the resort was untouched, although as with many local businesses, some employees had lost their homes in the area. Some 2,400 structures were burned by the fires, many of them cabins in the forests, but still only a fraction of the built infrastructure of the area. And as local organizations such as Cabins of the Smoky Mountains tried to tell in releases and updates, less than 5% of the land area was touched - some 17,000 acres in the entire region, while Great Smoky Mountains National Park alone holds half a million acres. Even in the first days, it was possible to drive all around the area without running into evidence of fires. And so it is now, even more so in this green summer in the Smoky Mountains. As for the people of the area, they call themselves mountain tough, on terms with Nature and its events. On Friday, May 26, 2017, a landmark event took place, as the Gatlinburg Sky Lift reopened, in time for Memorial Day weekend. 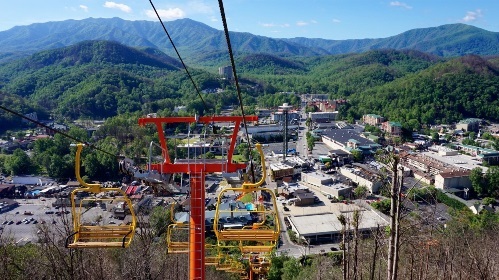 A great favorite for countless thousands of visitors over many decades, the Sky Lift offered one of the best views of Gatlinburg and the layered ridges of the Smoky Mountains all around. It was a fun way to lift up out of the bustle of the main drag and experience the true vastness of the area - a breath of air and a sense of place. The Sky Lift was one of the few attractions in Gatlinburg to be touched by the fires, and the owners decided to rebuild it completely. And in this way, life goes on, while the soil renews and the towns are alive and eager for guests to return. Great Smoky Mountains National Park is fully open for "business" (it's the only national park in the country with free admission). And it's a good year, here in 2017, to visit the Smoky Mountains, and the magical towns of Gatlinburg and Pigeon Forge. The U.S. Forest Service will hold open houses across the Nantahala and Pisgah National Forests from late June to early August to provide the public with opportunities to talk with Forest Service staff about local issues, district projects, and the Nantahala and Pisgah Forest Plan revision. "Public attendance at meetings like these helps us to understand your needs, concerns, and values and helps you understand Forest Service programs and activities," explains Allen Nicholas, Forest Supervisor for National Forests in North Carolina. Over the past year, the Forest Service has been releasing pre-draft plan materials on the National Forests in North Carolina website - www.fs.usda.gov/goto/nfsnc/nprevision. Additional materials are posted to the site’s Plan Revision Under Construction page as they become available. "This material is not a preferred alternative or even a draft plan. It represents our latest thinking which has been shaped by public input," said Michelle Aldridge, planning team lead. "In particular, we heard a lot from the public about how places matter to them, so we created a new chapter on Geographic Areas to reflect that." While there is no formal NEPA or legal comment period at this time, the Forest Service is accepting input at NCplanrevision@fs.fed.us with the subject line "Spring 2017 material Plan Building Blocks" or by mail at this address: Attn: Plan Revision, National Forests in North Carolina, 160A Zillicoa St, Asheville, NC 28801. Comments will be most useful when received by August 31.